Rick Dailey carves a turn on the highline race course at Killington,Wednesday, March 18. Wednesday, March 18 local “ski bums” battled it out on the Killington race course for the last regular season World Cup Wednesday event. 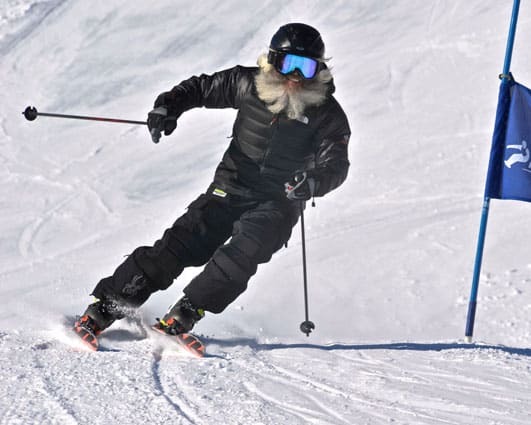 Rick Dailey, who competes in the Men’s B division, exemplifies the spirit of the competition; with his trademark beard, he always seems to be having a good time. The dual finals took place Wednesday, March 25, for those who placed in the top of each bracket, followed by the Ski Bum lunch barbecue at the Killington Ski Club. The party then continued at the ending awards ceremony held at Sushi Yoshi where winners of each division, team, and challenges, were awarded prizes.